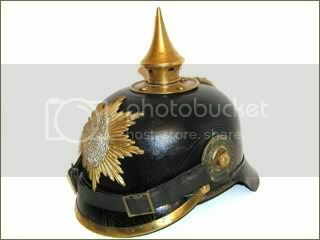 The model 1867 officer spiked helmet, or pickelhaube, was the style in use during the Franco-Prussian War (1870-1871). Many of these helmets were retrofitted following the war with the introduction of a metal back spine. 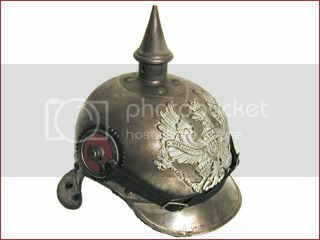 This particular example does not feature the spine, but does have the original spike of the older pattern helmet, original period liner, chinscales and single cockade of the Kingdom of Prussia. 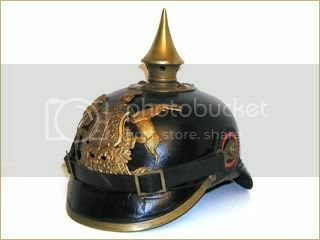 The officer spiked helmet, or pickelhaube, features a silk liner, brass chinscales and a taller spike than the enlisted version. This example features the front plate of the Kingdom of Prussia. 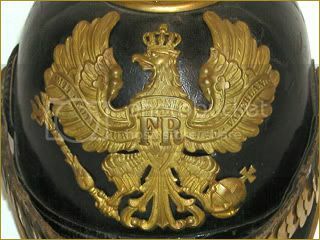 The NCO garade helmets feature officer style chinscales along with a raised starburst on the Prussian eagle. 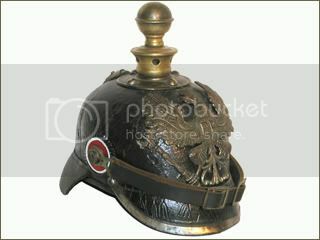 The Kingdom of Wurttemburg was one of the last of the German states to adopt the spike helmet. 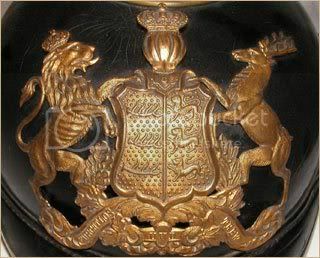 The helmet plate features a lion rampart facing a stag; both supporting a sheild bearing the State Arms of Wurttemberg. The scroll at the bottom of the shiled features the motto "FURCHTLOS UND TREW" (FEARLESS AND TRUE). 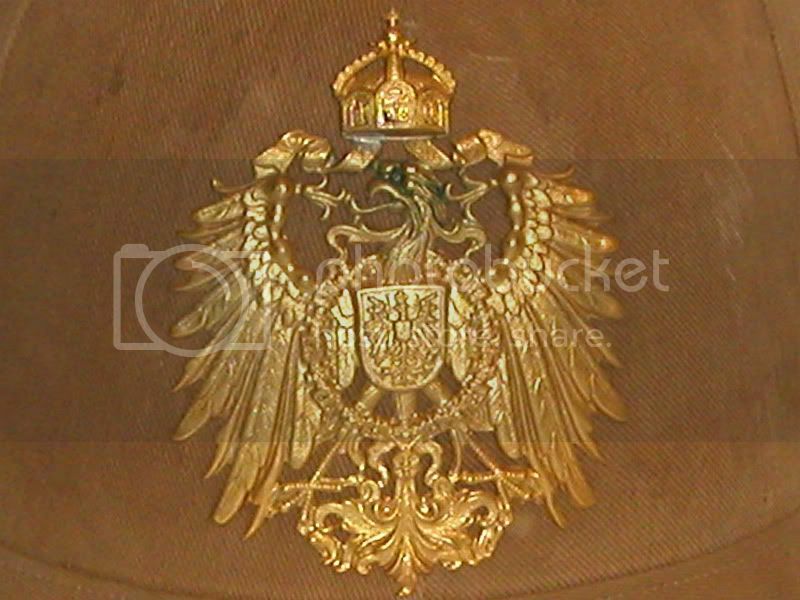 The helmet plate features the State Arms of Saxony, an eight pointed starburst in brass with a central Wappen in Silver. Additionally of note, this helmet features the distinctive Kokarden (cockades) of Saxon design. These are of the second type, which features the "V" shaped cut-out to accommodate the M1891 side posts. 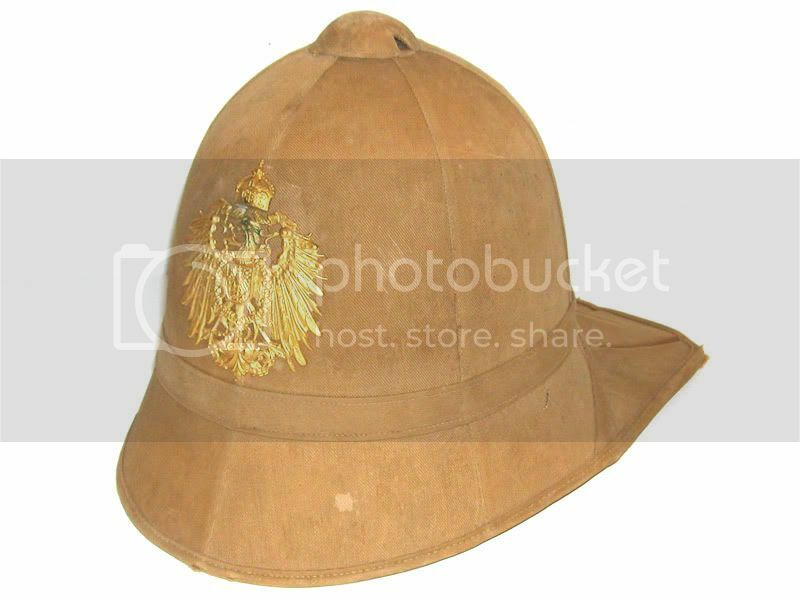 The field police uniform sun helmet of the Schutztruppen for German East Africa and Cameroon. 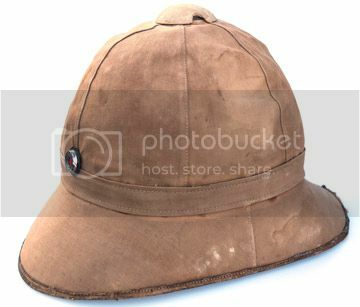 It was a cork helmet covered with a light brown cloth, worn without spike or fittings or cords. Commonly the national cockade was applied above the peak. 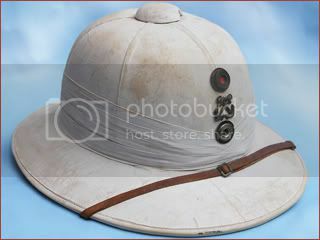 Several style of tropical helmets were used, including this Bortfeld Model 1902 pattern naval style Tropenhelm, which was issued to naval landing parties and marine units such as the III. Seebatallion. The rear of this model features a unique fold up design. 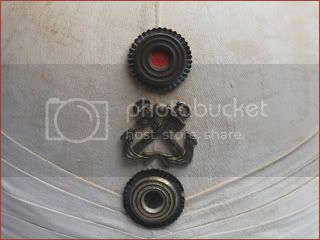 This example features the helmet plate used by the East Asiatic Infantry focres. 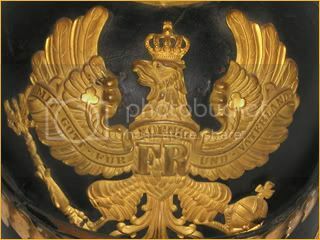 Inside the helmet is the maker stamp: "WAARENHAUS F�R ARMEE UND MARINE." 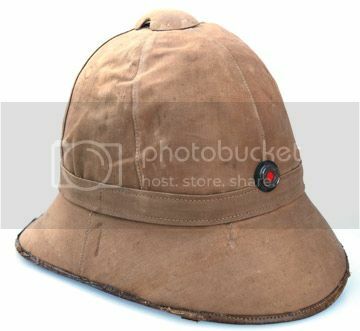 One of the various styles of sun helmets used by the German colonial forces in East Africa. 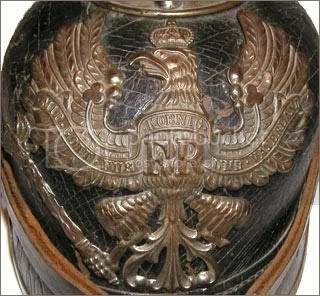 This example features the Prussian as well as German cockades, and interestingly the German Naval insignia. 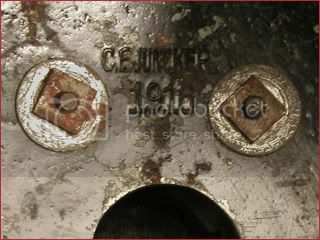 This is unique in that it could suggest use by a sailor from the K�nigsberg or other German naval vessel, who then fought with the army on land. 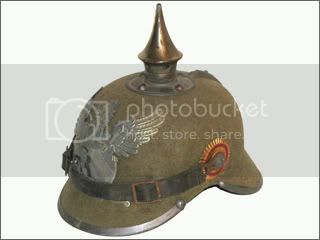 The Model 1915 helmet replaced the brass and German silver fittings with steel to aid in the war effort. This model also features a removable spike, to lower the outline of the helmet in the trenches. Instead of a spike, artillery helmets had a ball, which is also removable. 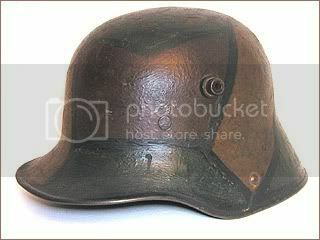 This helmet is made of felt -- thus an erzats or temporary material -- in part because of the wartime leather shortages, but also to meet the demands of equipping a larger army. This was one of several materials used as the war went on. 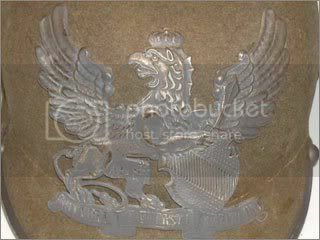 The helmet plate featured a winged griffin with the motto "Mit Gott F Furerst U Vaterland." 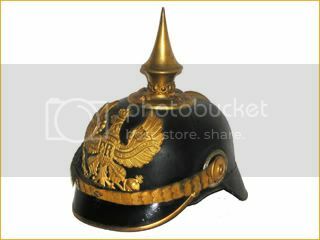 The Kingdom of Bavaria was the last of the German states to adopt a Pickelhaube. 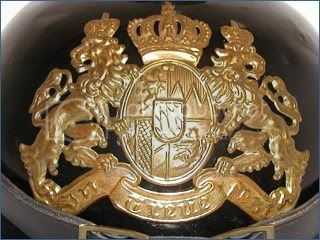 The Bavarian helmet plate displays two opposing lions supporting an oval shield bearing the State Arms of Bavaria. 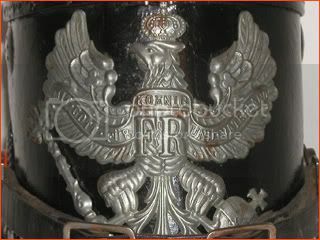 The scroll at the base of the plate reads �In Treue Fest (In Loyalty Steadfast).� Bavaria produced a number of ersatz helmets during the First World War including this example. This �ersatz� model was produced in tin possibly due to wartime shortages of leather, but it may also have been an attempt to provide some protection to the wearer. 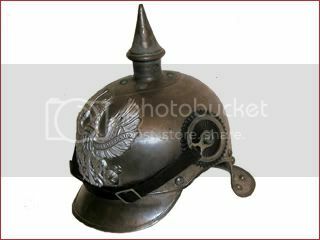 Cavalry helmet that features sudued polished steel with pewter rivets and visor trim. This is the wartime version that features removable spike and black leather chinstrap. This particular example is dated 1916. 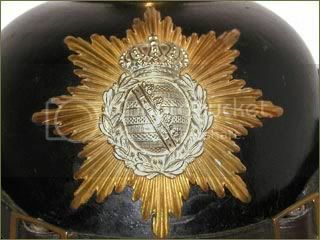 The origins of the distinctive Shako has been somewhat shrouded with the passing of time with some military historians accrediting the French with its development in the 1780's, based on the design of the civilian top hat, while others acclaim that it was based on the Austro-Hungarian or Bavarian Casquette headgear that was introduced at roughly the same time. It is known, however, that the Shako was originally adopted by the Prussian army as a experimental model in 1801 and was the standard headgear utilized by J�ger and Sch�tzen personnel during the Napoleonic Wars. 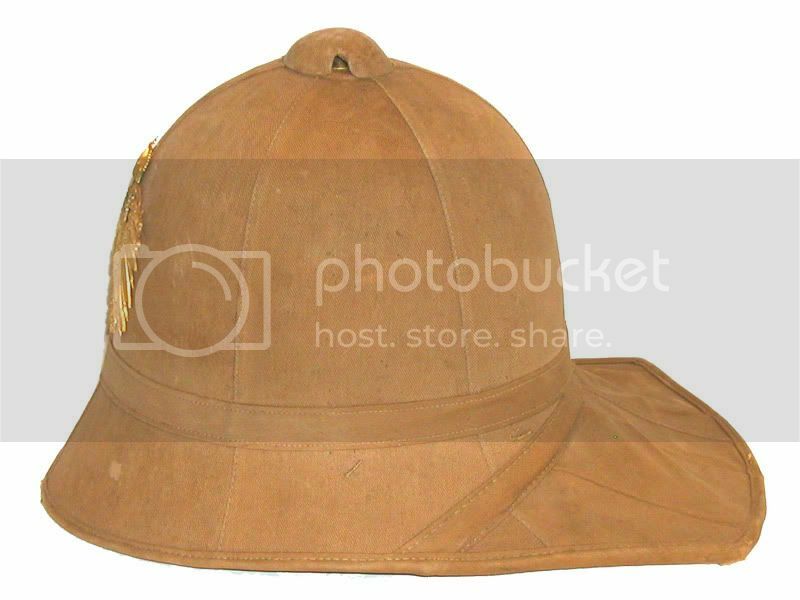 The 1801 pattern shako went through numerous modifications and in March 1854 a new pattern was officially adopted by J�ger and Schnelle Truppen, (Light Infantry and Mobile Troops), personnel. The body of the Shako has an extruding, humped curve reverse with downward sloping front and rear leather visors and a circular "coffee can" style top. Further minor modifications to the Shako occurred in 1860, 1888, 1891, 1892, 1895, 1897, and 1915. 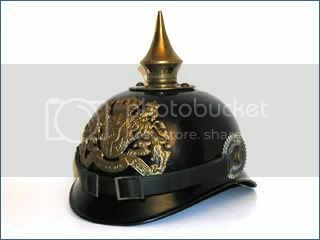 The Shako continued in use with additional modifications for the German police through the post-war Weimar era and on into the Third Reich period. 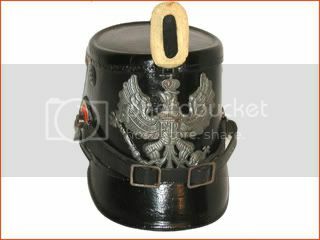 This example is of the 1915 pattern, blackened lacquered leather construction J�ger EM/NCO�s Shako with magnetic sheet metal fittings. 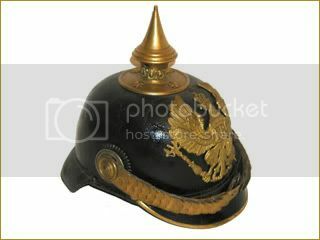 The front center of the Shako has the standard 1914 pattern, stamped, magnetic sheet metal, Prussian EM/NCO�s helmet plate. 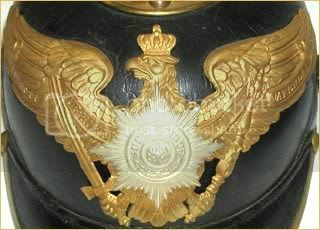 The helmet plate features the crowned Prussian eagle with upswept wings, clutching a royal scepter and a royal orb with an embossed scripted banner superimposed on its wings and breast. The embossed script to the banner consists of, "Mit Gott F�r Koenig und Vaterland", (With God for King and Fatherland), and has the royal, "FR" cypher to its breast indicating, Friedrich Rex, (King Friedrich). 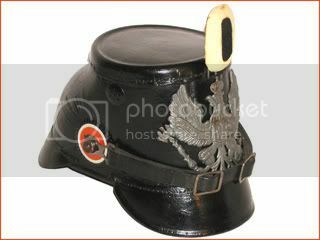 Instead of the Prussian cockade, Shako's were typically worn with a state field badge that consists of a carved , vertically oval wooden base with an outer white cotton covering encompassing a central black wool covering. 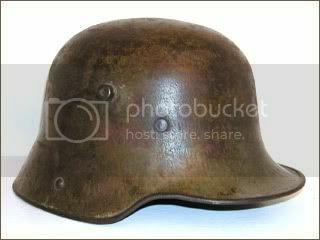 This first German steel helmet was introduced in the summer of 1916 with field green paint. It features a leather three-pad liner system. 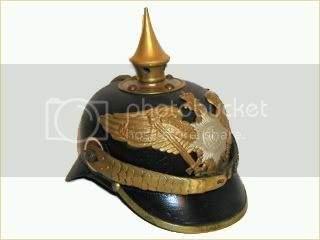 This Model 1916 German helmet features the standard authorized paint patten.